Lots of different types of food go towards making up a healthy balanced diet. If you could choose whatever food you'd like to have on your dinner plate, what would you pick? In this picture there's a special plate that you have to fill with all the right types of food. Can you cut out the different food groups and place them on the right section of the plate? 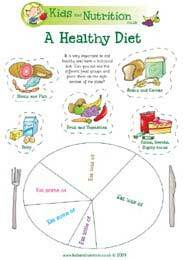 Why not Download the Healthy Diet Cut Out Activity Sheet and see if you can fill the plate correctly. Really helpful site. Provides lots of free resources, especially for last minute planning! !